My father’s entry into the world of mainframe programming began with an apprenticeship as a “computer operator,” a person whose job it was to load and run programs into the 360, feed huge boxes of multi-part forms into IBM 1403 chain printers, and collate the printed output for distribution. I would visit him at work from time to time because I was fascinated with the hulking mainframes in their climate-controlled rooms, but also to play with the keypunch machines, which I viewed as the biggest, noisiest typewriters imaginable. Before heading off to MIT, I filled two huge trash bags with the little rectangular chips left behind after the cards were punched. (Imagine my surprise on hearing the term “chad” – the name of the chips – two decades later in reference to a presidential election scandal.) A handful of chips casually tossed into a dorm room guaranteed that the victim would be finding them in his clothing for months. They were my nuclear deterrent from being pranked. In Canada, all keypunch cards were printed by a company called Control Data under licence by IBM, who used specially engraved cylinders to print the cards. After the cylinders useful life had passed, they were stored in a small room accessible only by a ladder. And then they were forgotten for 25 years. In the mid-1990’s, while talking to the successor company to Control Data, I noticed some intricate cylinders sitting on a traffic manager’s desk and asked him about them. He told me the story of the cylinders and mentioned that they were quite a conversation piece – everyone asked about them. He remarked that the company had just discovered they still had the plates around and were preparing to dispose of them. I convinced him to sell them to me. As a result, I have the entire set of master printing plates for the keypunch cards that were such an essential part in first bringing the power of the computer to the mass market. These plates were made from an aluminum-magnesium alloy and then individually etched in England using a photo-engraving process. Originally they cost over $300.00 each ( in 1965 dollars). The plates were chrome-plated to add strength. Ink was applied to the positive-image plates, which was transferred as a negative to a rubber roller, which was used to apply the ink to the card stock. 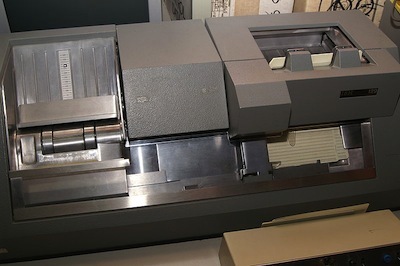 Direct transfer from plate to card was avoided because any change to the smoothness of the cards from printing impressions would cause feeder jams, the bane of keypunch operators. I inked the drum and carefully rolled it across a sheet of paper, then scanned the impression and flipped it in Photoshop to make it readable. A full-sized version of the scan is here. Now I have a bit of computing history on my desk. Why did I chose this particular plate? 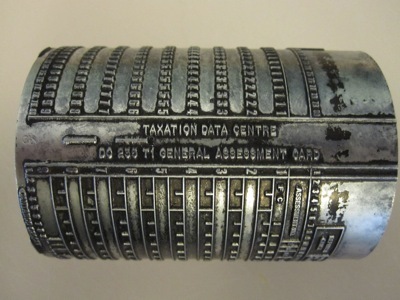 Have a look at the photo of the drum; you can read “TAXATION DATA CENTRE GENERAL ASSESSMENT CARD.” That’s right, it was used for collecting taxation data from Canadian citizens. How’s that for Olympic spirit? This entry was posted in science and tagged printing, technology. Bookmark the permalink. Wow, that punch card machine brings back memories! I don’t know how you frame it, but it should be next to the Guttenberg page. It’s on the mantel next to the Silurian salt crystal and the Long Now Clock cam.